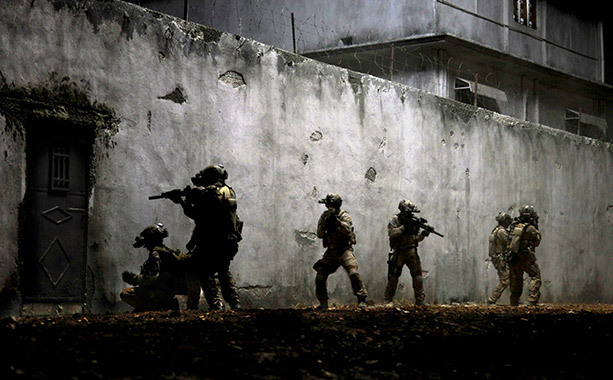 When Osama Bin Laden was killed by American forces a year and a half ago, a movie release was inevitable. How could Hollywood pass up such a juicy story as the hunt for the man responsible for the deaths of 3,000 innocent Americans? Although such a film was expected, it was still a surprise to see it released the very next year. Even more shocking is that it is a damn good film getting all sorts of Oscar buzz, although it certainly helps to have the talented Kathryn Bigelow at the helm. Zero Dark Thirty begins in 2003 with the introduction of Maya (Jessica Chastain), a CIA officer who has been reassigned to work at the U.S. embassy in Pakistan. She is teamed up with Dan (Jason Clarke), a fellow officer who has been interrogating detainees as to the whereabouts of Osama Bin Laden (“UBL”) and other Al-Qaeda terrorists. As this is the early 2000s and during the Bush administration, this involves gratuitous torture, much of which we are there to witness. In fact, many have deemed these scenes to be controversial, some stating that they glorify torture. I don’t see it that way, as none of the interrogators are actually enjoying the torture, especially not Maya, who seems startled by it at first. It’s also hard to say just how much the torture helped in the hunt to find Bin Laden — it’s not like the only helpful information came from those who were abused. But I digress. A few years later, Maya has her eyes on a well-concealed man known as Abu Ahmed. She is determined to find him, whose whereabouts are unknown according to every detainee she talks to. Others involved in the CIA, including the top chief Joseph Bradley (Kyle Chandler), tell her she is wasting her time. Yet Maya is anything if not persistent. It’s a long paper trail to Osama Bin Laden, and when the CIA finally believes to have discovered his location, they are anything but certain. Everyone involved have varying levels of confidence as to whether or not “UBL” is in the targeted compound, and there is a great deal of uncertainty as to whether or not they should go through with the raid. Of course, we all know how this plays out, but it’s still fascinating to watch as we follow the breadcrumbs leading to the world’s most wanted fugitive. While many are bound to praise the scene during the final raid inside Bin Laden’s fortress, I found the thrill of the hunt to be far more enthralling. I only vaguely remembered hearing about some of the “smaller” terrorists attacks over the years, and it was quite stunning to see them reenacted on screen. Watching Maya piece together every lead or hint she found became an intriguing process, even if the end result was known. Perhaps most interesting is that the film focuses so heavily on a female’s perspective. I was not aware that Maya (or rather, her real-life counterpart) had such a crucial role in the pursuit of Bin Laden, and without her persistence it’s hard to say whether he would still be alive. The role of Maya is played admirably by Jessica Chastain, who continues to rise to the occasion with every new role she takes. Maya’s progression (or rather, deterioration?) over the last decade is remarkable, as she toughens up with every attack, even becoming a bona fide badass by the end. The rest of the cast is impressive as expected, another who’s who of great character actors. 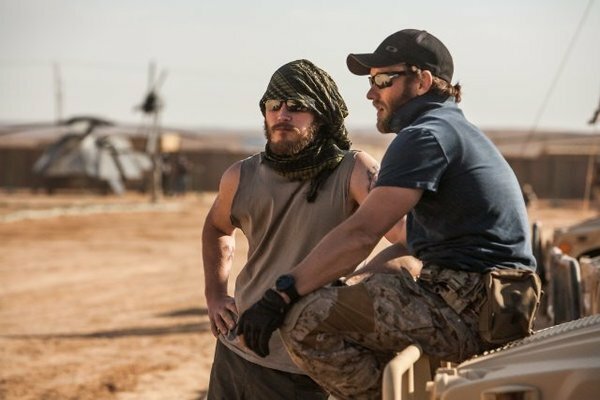 Jason Clarke and Kyle Chandler have important roles in the CIA, the former of which caught my eye as someone I hadn’t even heard of before. Familiar faces such as James Gandolfini, Mark Strong, Jennifer Ehle and even Mark Duplass all make welcome appearances, each playing a small, but important part in the film. 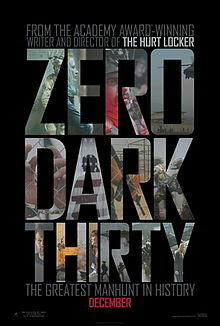 While Zero Dark Thirty succeeds in many areas, I am a little surprised by the overwhelming praise surrounding it. The film’s running time — nearly three hours — could have used a little trimming, and the final raid was surprisingly anticlimactic. It’s kind of amazing that the operation had so many mistakes and yet the mission was still accomplished; however, this is well-known information and still fresh in the mind. Perhaps with a few years perspective, this could have been more riveting. Regardless, I rather enjoyed the film overall, and any reservations I have had are relatively minor in the grand scheme of things. Bigelow has been on a roll lately, and it will be interesting to see where she goes next. When a movie runs for as long as Zero Dark Thirty, I can’t help but lose interest in the story, regardless of how captivating the movie is. I’m surprised this movie had a rather anticlimactic ending. I think I’m in the minority when it comes to the ending. It seems most found it to be exciting, but I enjoyed the thrill of the hunt more than anything. Thanks for the comment! Good review Eric. One of my favorites from last year and almost up-there with the Hurt Locker. Not as good, but close enough. You know, I have to agree with you there. I prefer The Hurt Locker over this, though it seems we are in the minority on that one, Dan. Just to clear up the apparent confusion about the timing of the film… This movie was actually in progress prior to Bin Laden’s execution. Bigelow was making a movie about the hunt for Bin Laden, and then when the pre dawn raid went down, she had to revamp it, but still… that’s how come it turned around so quickly. Yeah, good point about the filming process. From the sounds of it, Bigelow and Boal pretty much started from scratch once Bin Laden was killed, but you’re absolutely right that they had been researching the story long before that happened. Either way, it’s an impressive feat that they were able to put it all together so soon! Great review Eric, glad you appreciated this one as much as I did. I had no idea about Maya or whoever her real life counterpart was either, but Chastain’s performance was superb. I didn’t think the ending was anti-climactic though, in fact, that scene of Maya on the aircraft career was quite emotional and seemed right regarding the circumstances. Thanks Ruth. I liked the final scene of Maya quite a bit, but I felt the actual raid was a bit anticlimactic. Then again, it was very accurate toward the real event, so they nailed it in that regard. Really enjoyed the film overall, though. Still a very good film that I liked quite a bit. Hmm, yeah I think I get what you’re saying. I thought it helped that Chastain showed noticeable signs of deterioration over the years. It seemed that she really toughened up by the end of the film. But yeah, a very well-made film that should get an award or two. Really looking forward to this – didn’t realise it was that long though! Good review, thanks! Yep, it’s one of many recent films that are pushing three hours. Not sure what’s up with that this year, but this, Lincoln, Django, Cloud Atlas and The Hobbit are all very lengthy. Glad you liked this. I found it really interesting and Chastain was just fantastic. Yep, Chastain’s Oscar nod was well-deserved.